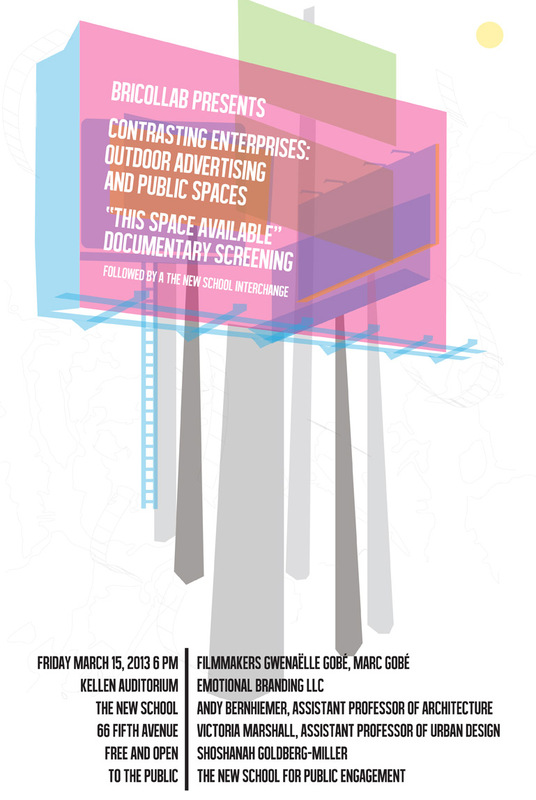 A screening of the documentary, This Space Available, followed by a discussion. Common in an urban setting, outdoor advertising dominate public spaces. Municipalities generate revenue from advertising agencies erecting large, high production value, mainstream messages. In confronting the nature and prominence of this industry and cultivation of cityscapes, there are complex issues of economics, urban development, public space, aesthetics, and availability of resources within a community to express them. This Space Available is a documentary that confronts these issues. Inspired by Rio de Janeiro municipal decision to strip all the billboards from one of Brazil's largest cities, director Gwenaëlle Gobé, investigated worldwide, looking how billboard industry impacts various cities. She connected with powerful members of the advertising industry as well as guerrilla street artist groups in order to grapple with the question, who is the public space for and who can express there? 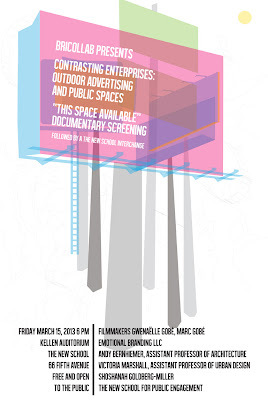 She catalogs the efforts and statistics of the advertising industry while showcasing the oppositional efforts that seek to reduce the amount of outdoor advertising in cities. The conversation at The New School with faculty Andy Berhiemer (Parsons The New School for Design), Victoria Marshall (Parsons The New School for Design), and Shoshanah Goldberg Miller (The New School for Public Engagement) discuss the contrast between commercial and public spaces with the idea that it is possible to traverse encounters between people as mediated through architecture, design, and municipal policies. Sponsored by the BriCollab project in the School of Media Studies. The Nation's #1 full service automotive advertising agency. Specializing in traditional, digital and social marketing and branding automotive advertising agency.